Larson Boats of Little Falls, Minnesota which celebrated over a century of boatbuilding a couple of years ago, for 2015 offers three distinct boat lines; Larson LX, LSR, LXi, and Cabrio series of runabouts, sportboats, and cruisers, plus the Larson FX series of fibreglass fishing boats, plus the Escape by Larson series of aluminum pontoon boats. 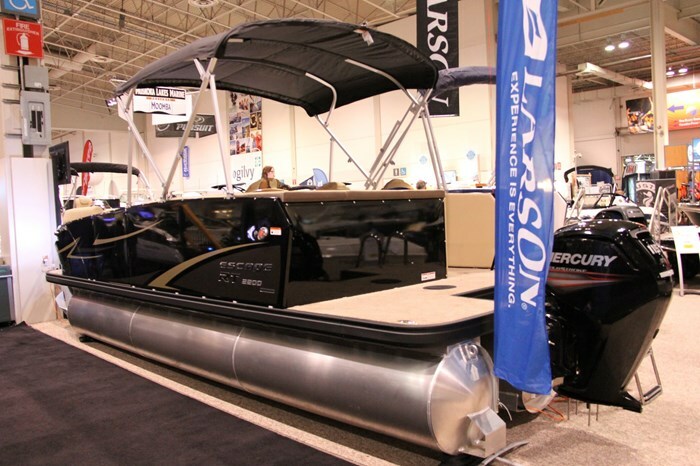 Escape pontoon boats come in two series; RT with nine models, eight interior layouts, and three lengths, and TTT (for Taper Tube Technology) with three models, eighteen interior layouts, and three lengths. 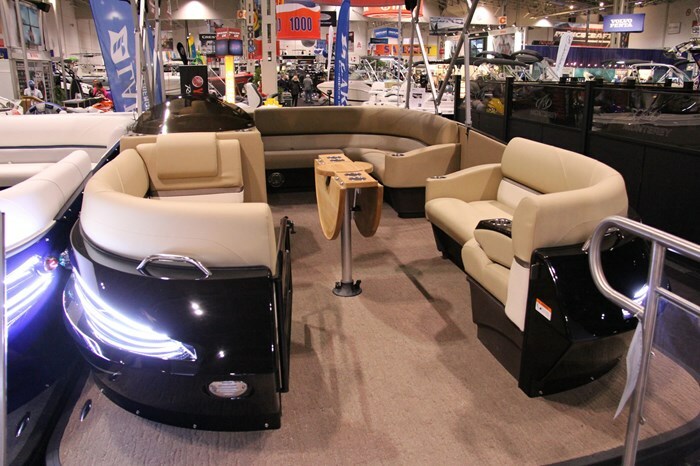 The RT series offers three model designations; RT Cruise, RT Fish & Cruise, and RT Fish, the latter two available only with two pontoon logs whereas the RT Cruise is available with two or three pontoon logs in all three of its lengths – twenty, twenty-two, or twenty-four feet. The Escape RT Cruise 2200 Triple then is the mid-size of the RT Cruise models and comes with the third, centre pontoon log. What the third pontoon gives you is increased capacities. Carrying capacity in this model is increased from ten persons to twelve, fuel capacity is more than doubled from 25 to 52 US gallons (95 to 197 litres), and maximum horsepower rating is increased from 135 to 200. 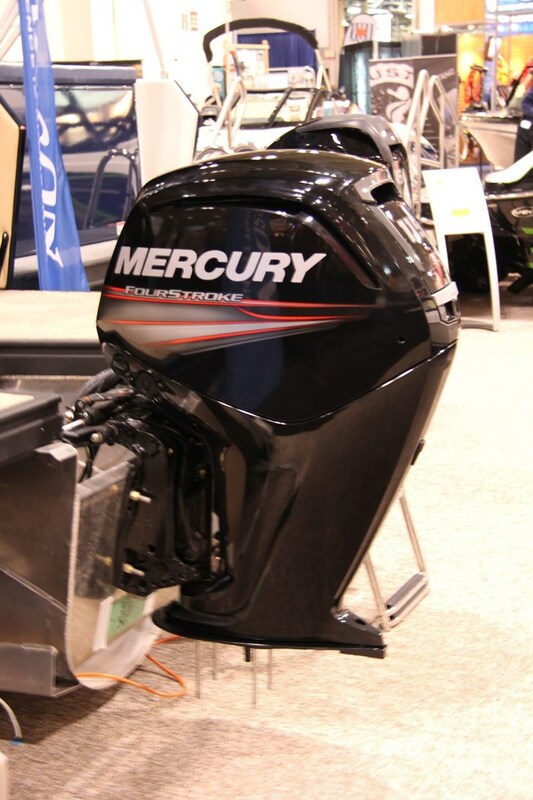 And Larson being independent from any motor manufacturer, you can choose your outboard brand from your choice of Mercury, Honda, Yamaha, Suzuki, or Evinrude. Whether you choose two or three logs, there are two interior floorplan layouts from which to choose. With either layout, the bow and helm areas and the starboard side transom gate location remain the same whereas the aft portside L-shaped lounge in the standard layout is shorter along the port side but includes a rear sunpad with storage. In the optional layout, there is no sunpad and the lounge is right up against the aft fence, is the same width along the aft fence but is considerably longer along the port side and becomes a chaise lounge. All furniture has custom molded bases with built-in storage and venting and includes custom top stitching and colour accenting. 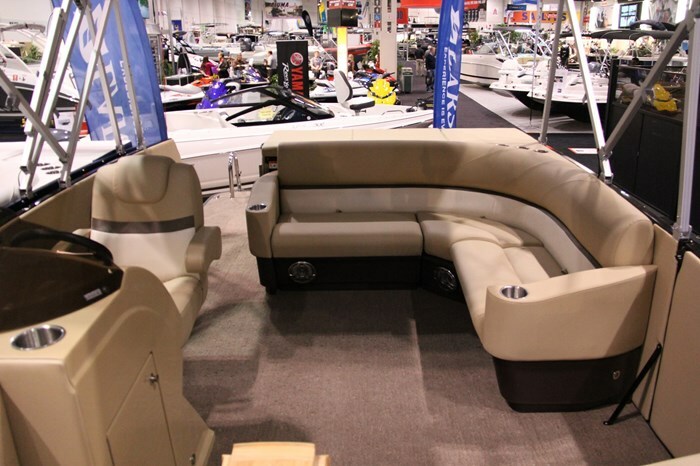 Both sides of the bow area have wrap seating lounging couches with armrests. 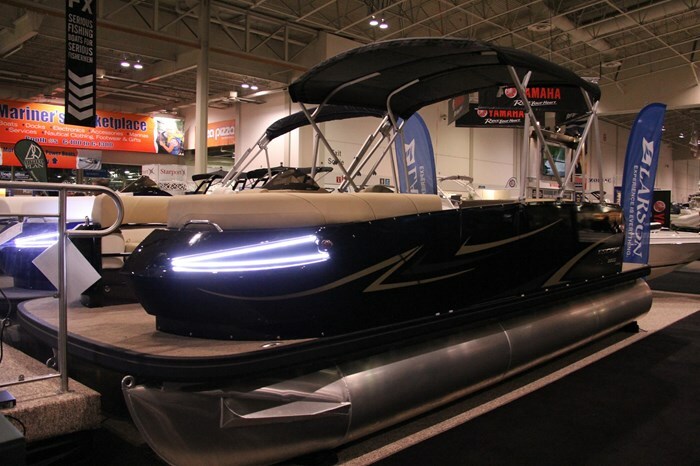 The gracefully curved and colour-matched fibreglass bow corner sections add a distinct touch to the RT Cruise series. Exposed inner fence areas have upholstered fence pads. Flooring material is 20-ounce marine carpet. Blue interior courtesy lighting is standard as are eight stainless steel cupholders. 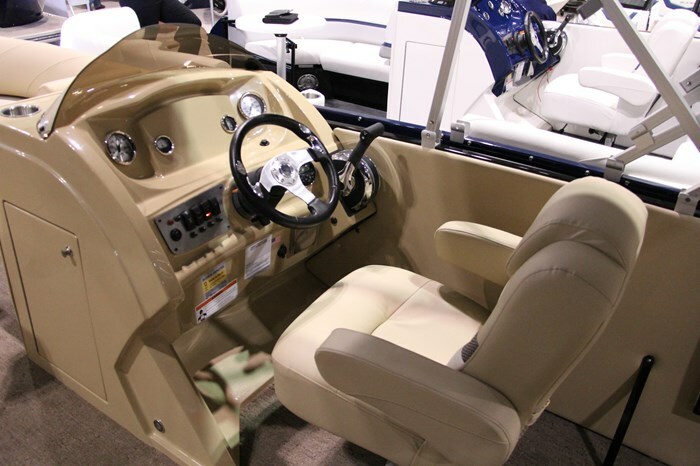 The captain of the RT Cruise 2200 Triple luxuriates in a recliner chair with adjustable armrests and faces a raised, two-tone fibreglass molded helm with integrated footrest and built-in portable cooler storage with door. A four speaker stereo with Bluetooth, MP3, and iPod connectivity is standard. Other standard equipment includes pop-up cleats, a stainless steel 4-step boarding ladder with built-in handrail and extended integrated swim platform, and a bimini top with boot. You have an exterior colour choice of black, white, blue, or red with standard graphics or select from optional Sport Package graphics with two-tone paint or Premium graphics on those same four basic colours. The Premium Package also includes all-tan gelcoat on the console, silver gauges, tan base vinyl with wiggle accent, dark brown seat bases, tan carpet, and tan and dark standard graphics. Other notable optional equipment includes underdeck sheeting, an adjustable helm pedestal, drop-leaf bow table with integrated cupholders, a portable cooler/table on wheels, portable cupholder, docking lights, dressing room curtain, porta-potti, interior blue strip lighting, in-floor storage for watersports accessories, etc., two choices of ski-tow bars, several canvas options including full enclosure plus covers, and a black painted or galvanized Shoreland’r trailer.